New MacBook Pros Charge iPads In Just Three Hours, Just Like Wall Outlets Do - iPhone.MY - Daily News On Mac, iPhone, iPads, iPods and more! Previously we reported that connecting your iPad to a MacBook Pro was the least efficient way for users to charge their iDevices. Today, we’re happy to report the latest MacBook Pros are much better at this process. In fact, they charge an iPad in same amount of time, as an electrical outlet does, according to news first reported by 9 To 5 Mac. 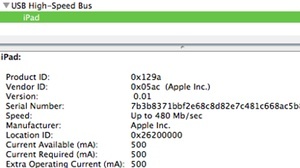 The latest MacBook Pro, which was released last month, includes a combined 2100 mA of power. This is similar to what you’d get using a wall power adapter. 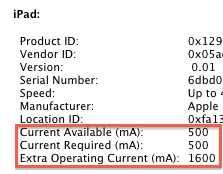 Conversely, the previous MacBook Pros included just 1500 mA of power. What this means is that instead of taking seven hours to hit an 80 percent charge like the previous model, the new MacBook Pros will charge an iPad in just three hours.